Every year, at Thanksgiving, we make a big bowl of creamy mashed potatoes and, every year, they remain mostly untouched. Because...stuffing! Oh, the potatoes get eaten up as part of the long weekend leftovers but the stuffing never survives past the first dinner. And nobody in our house wants just a little bit of it that comes out of the bird. Oh, no, stuffing around here needs to be made in mass quantities as a separate side dish. So, to keep the peace and avoid people being stabbed with forks while diving for additional stuffing, we usually make it in individual portions. You don't have to serve it in cute little hollowed out squash bowls but we decided to be a little fancy. Because...Thanksgiving! Slice each acorn squash in half, lengthwise and scoop out the seeds. You should have four boat shaped pieces. Place on a baking sheet lined with parchment paper and roast in the oven for 20 minutes or until the squash is fork tender. Place the cooked squash aside to cool and spread the bread cubes out on the baking sheet. Bake in the oven for about 10 minutes or until the cubes are a lightly toasted. Add two tablespoons of the butter to a large skillet or cast iron pan. Add the diced onion and, on medium heat, saute for about 10 minutes until translucent. While the onion is sauteing, add the chicken stock and the remaining 6 tablespoons of butter to a pot and heat, allowing the butter to melt. Scoop the cooked flesh out of the acorn squash but leave enough in the skin to use as a bowl. Add the squash and toasted bread cubes to a large bowl. Stir in the cooked onion and ladle in the warm chicken and butter stock. Fluff with a fork to combine and make sure the bread absorbs the liquid. Stir in the rosemary, thyme, sage, parsley and slivered almonds. Season with the za'atar, salt and pepper. 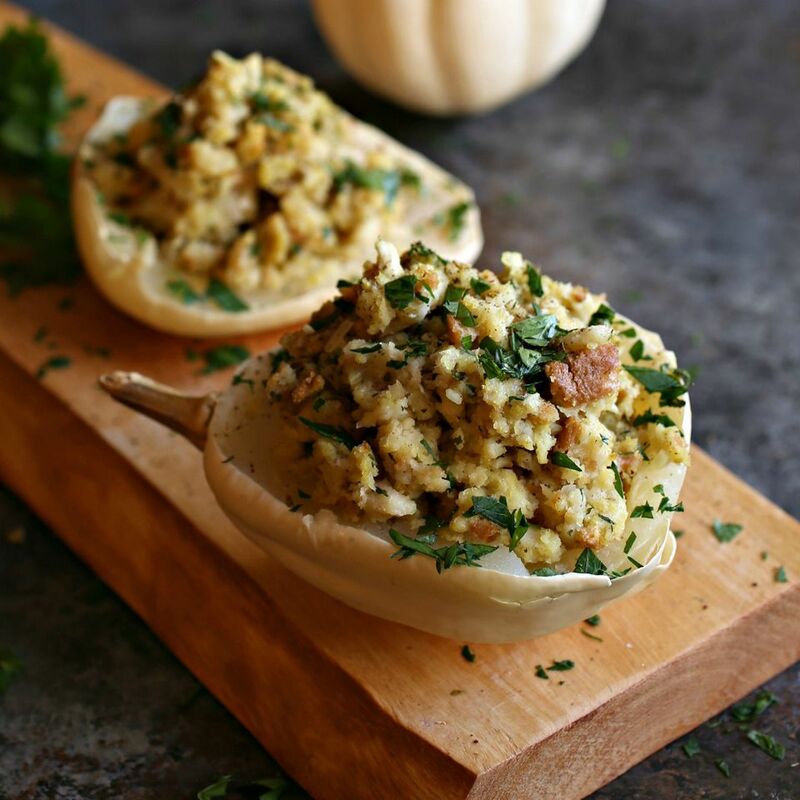 Scoop the stuffing into each of the hollowed out acorn squash shells and, either refrigerate until ready to use, or return to the oven for about 15 minutes for the flavors to meld together and the stuffing to heat through. You can also forgo the squash bowls and just scoop into a large casserole dish or individual ramekins.